Why to Live with Less Energy? Flaws, Fallacies and Follies in Name of Science, Where Science Went Wrong? The Loud Cry of A Perpetual Motionist. Is He a Crackpot or genius? ....The volume deals with the attributes of domain of science. It shows what science is and what it is not, what material is included and what is excluded, and not only where the boundaries are located but also how definite and distinct are these boundaries. It also discusses who scientists are, what they do, and how do they work. Without any serious investigations into perpetual motion and any effort to invent perpetual motion, scientist declared that perpetual motion is impossible and it is absurd. It is the characteristics of the ‘conditioned mind ' that it regards as absurd anything that does not agree with itself; i.e. with accepted conceptions. But it would be correct to say that accepted conceptions are not necessarily true; and, therefore, absurdity is not necessarily identical with untruth. We have many examples from the history of science to demonstrate this assertion. The pronouncement of the heliocentric theory was regarded as 'absurd.' Yet it has been found to be true. It seemed absurd for no other reason than because it conflicted with accepted doctrines of religion. In the course of time, facts will always prove or disprove whatever the Mind, the chief arbitrator, approves or disapproves of. Sooner or later, science has to recognize truth of perpetual motion and realize that law of conservation of energy is based on a bundle of more or less illogical conceptions corollaries of which may be true, many of which are certainly false. ....Science throws no light on the realm of moral, aesthetic or religious beliefs. Science can’t help us with questions about the supernatural. Study of science only implies the study of material universe in which man live and of which he is a part. The scientific method limits the search for reality to the physical; it excludes the spiritual. The scientific method cannot address ethical questions. The problem of deciding good and bad, right and wrong, is outside the determination of science; thus the scientific method is amoral. By definition, it cannot speak to issues of ultimate origin, meaning, or morality. For such answers, science is dependent on the values and personal beliefs of those who use it. Science, therefore, has great potential for both good and evil. It can be used to make vaccines or poisons, nuclear power plants or nuclear weapons. It can be used to clean up the environment or to pollute it. ....The scientific method has many other limitations. Science does not make moral judgments. Anyone who tries to draw moral lessons from the laws of nature is on very dangerous ground. To find the answers to the "big questions" of life, we cannot look only to science. Scientific method is limited to a process defined by that which is measurable and repeatable. It can be used to argue for God or against Him. Science by itself offers no moral guidance or values to govern our lives. All science can do is show us how natural law works, while telling us nothing about its origins. Scientific method can only comprehend physical reality, lacking as it does and denying the benefit of psychic intuition and gnosis that enables perception of other (non-physical) worlds and cycles of existence. ....The very success of mathematics tempts scientists to overdo it, to ignore the limits of science. Science advance its boundaries to explore the area of known by excursions into unknown by finding relationship between previously uncorrelated facts, by making new observations. Every scientist is aware of great area of ignorance in or near his specialty. Every invention or discovery only whets appetite for more opens up new streams of knowledge and points out more paths to follow into unknown. Therefore, the question that how much science can expand beyond its present boundaries cannot be answered for the extent of the unknown or uncorrelated is infinite. Therefore science has to proceed without limit. ……..
 M. Polanyi, Life’s Irreducible Structure”, Science, 1968, 160:1308-1312? WHY DID NOT SCIENTIFIC REVOLUTION OCCUR IN INDIA? HOW IS THE SCIENTIFIC METHOD CARRIED OUT? WHAT IS THE REALITY OF OBSERVATIONAL WORLD? IS SCIENCE AND TECHNOLOGY AT ITS END? Are The General Laws Of Nature Pure Convention? Can We Revive Our Glorious Past? Hopefully, you will agree with my views that you will find in the pages of my EEC series of books but I am also equally aware that you may not agree with me on certain points discussed in these volumes. Before arriving at any definite conclusions to anything published in these books, I shall advise you to do your own research & contribute your own unique creative insights. My views and thoughts contained in these books are mostly anti scientific establishment, non-dogmatic. They contain explorations of ideas largely found in Eastern ancient Wisdom like Vedas etc, as well as my own creative ideas with freedom of thought. According to doctrine of “Syadvada” in Jainism, no truth is final, therefore, never bound yourself to saying this is the only truth. Truth is always plural and that which is plural is not the “absolute truth”! 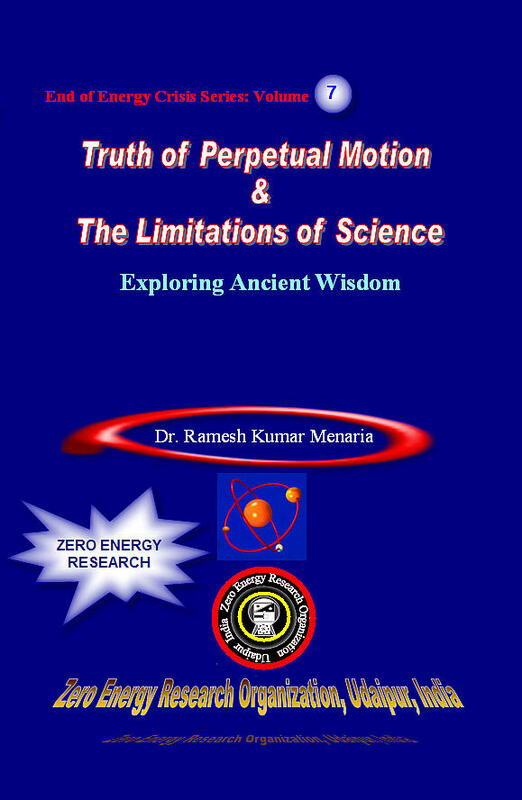 Dr. Ramesh Menaria's entire EEC series of books with 18 titles fills up more than 7000 pages. Contents and page numbers of EEC series of books are subject to minor changes as all the 18 manuscripts are being edited and reedited until they finally get published by Deva publishers. NB: This site will go on line long before all possible topics have been treated; please forgive me if you seek information on a given topic and I have no information there yet.